Do any of you know someone that knows what you want, even before you know you want it? Kevin Deal of Upscale Audio and PrimaLuna US is that kind of guy. Known the world over as a top purveyor of vacuum tubes, he and Herman Van den Dungen started PrimaLuna about 13 years ago with a humble integrated amplifier for $995 that changed what we could all expect from a small tube amplifier. Unlike the Dynaco’s of the 60s, the PrimaLuna ProLogue 1 was robustly built, beautifully finished, and as I said in The Absolute Sound, it sounded bitchin. The product line has grown from there, and PrimaLuna has added a higher scale DiaLogue series along side of the ever evolving ProLogue series. Most of the two output tube per channel PrimaLuna integrated amplifiers produce about 40 watts per channel. Kevin Deal knows that a lot of us love the lush, tonally saturated sound of the EL34 output tube and that’s what he sent me for review; the new DiaLogue HP Integrated with eight of them under the hood. Wow. Yes, you can (and I did) run the HP with KT-88s or even KT-120s for a bit more power and that may indeed be your cup of tea. Swapping the EL-34s for a set of KT-120s proves interesting, driving my Quad 2812s, changing the vibe. 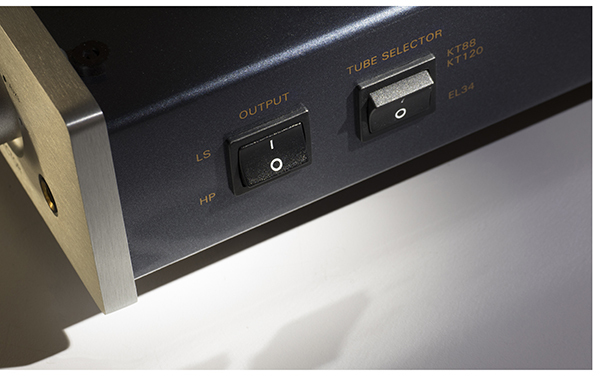 Listening to more bass heavy tracks, the KT-120 tubes offer slightly more control down deep than the EL-34s. Swapping speakers from the Quads to the GamuT RS5is, which have more bass extension, this is more noticeable than through the Quads. Tracking through Yo Gotti’s Art of the Hustle went from a polite presentation with the EL-34s to hard hitting beats with the KT-120s in place. A touch of midrange and upper high frequency delicacy is lost with the bigger tubes, but the extra power and control is tough to ignore. Again, it will depend on your speakers and listening tastes, but it’s so cool that you can fine tune this amplifier to this degree; especially considering how many of us fall in and out of love with certain speakers. According to the spec sheet, the HP produces 70 watts per channel in ultralinear mode with EL-34s and 85 per channel with KT-120s. Deal says that the HP will even produce 96 watts per channel with KT-150 tubes, making it one of the world’s most powerful tube integrateds. Keep in mind, KT -150s about $100 each, so this will add a few bucks to either the retail price, or a casual retube. The HP stands for “high power” and “headphones” but we’ll address that later. Deal advises me to “not even listen to the amp until it’s been on for at least five days,” but journalistic curiosity gets the best of me and I begin listening right after the photo session. Right out of the box it sounds seriously good, but as the tube master advises, at about the hundred hour mark, the HP openes up in a major way. Starting each day’s listening session with the same track, Jean-Michel Jarre’s “Diva” from the Zoolook album. This track sounds big and airy, with Laurie Anderson’s reverse tracked vocals bouncing back and forth between the Quads as it should, but on the sixth day, it sounds like she is sitting in my lap, whispering in one ear, then the other. The effect is cool, in a hallucogenic way, but almost scary at times. That’s what great sound is all about! Should you buy an HP for your room, take the advice; just let it play for a week and then prepare to be impressed. Unlike the ProLogue Premium integrated, which only operates in ultralinear mode, the DiaLogue Premium HP can operate in both ultralinear and triode mode. Like a totally 80s dude’s mullet, the HP has two very distinct personalities. Choose triode to be mellow (business in the front) and ultralinear to rock the house (party in the back). Triode mode is available at the flip of a switch, delivering 40 wpc and 50 wpc, respectfully, depending on your tube choice. If you haven’t experimented with triode mode yet, you’re in for a surprise, hopefully a pleasant one. While the lower bass notes have slightly less grip, the midrange takes on more luster, and you will either be seduced by it or not. Those loving smaller scale music, jazz and anything acoustic, will be in for a lovely experience in triode mode. It’s worth noting that triode mode has slightly less gain, but considering the 2-4 volt output of most modern DACs and phonostages, this will not be an issue for 99.99% of all users. The extra power provided by eight power tubes is what really gives triode mode in the HP extra punch; 40-50 watts per channel is so much more useful than the 20-25 watts per channel that an amplifier with a single pair of output tubes per channel usually delivers, again making the HP so versatile. 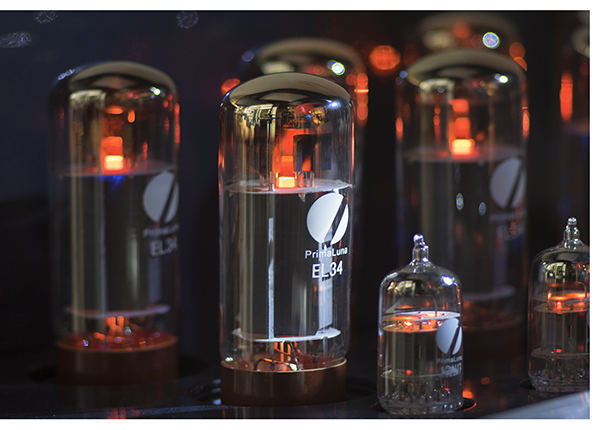 On many levels, the higher output of the KT120 tubes in triode mode to be a near perfect compromise, yet the EL34s in triode mode are closer to that vintage Marantz/McIntosh tube sound many tube lovers grew up with, it’s tough to choose. Just like all the other PrimaLuna amps I’ve used, if you really want to head down the vintage path further, you can swap the power tubes out for 6L6GTs. This gives the amp an even warmer sound, reminiscent of the Dynaco Stereo 70, so this might not be for everyone. Thanks to the latest version of PrimaLuna’s Adaptive Auto Bias, swapping power tubes is a snap, and you don’t have to fiddle with anything. They’ve incorporated some other handy features over the years, including at “Bad Tube Circuit” that shuts the amp down in the event of tube failure, so no damage will come to the output transformers or other components. A few of my favorite amps from other manufacturers have required a service call due to a bad tube. The two times I have had output tubes fail in my own PrimaLuna amplifiers, the LED came on without drama. A quick tube replacement and the music was back in action. There are two other levels of protection to protect the valuable output transformers as well, so these amplifiers just don’t fail. Talking to a number of PrimaLuna owners over the years never turns to component failure. The only aspect of the company I can’t comment on is their service department; I don’t know of one that’s ever needed service! Dusty Springfield, Shelby Lynne and Ella Fitzgerald prove stunning through the Quads in Triode mode, coming through with a sultry, silkiness that embodies every romantic notion you could ever have about an amplifier full of glowing bottles. Dim, the lights, queue up your most beloved tracks and add a bit of whatever adult beverage you enjoy; this is your ticket to audio nirvana. In the context of a system using the Quads at $12k/pair and the $3,000 Simaudio Neo 260D CD player/DAC, the level of musicality the HP delivers is quite unbelievable. Everyone unfamiliar with PrimaLuna thought this was a much more expensive amplifier. Swapping the Sim for the $30,000 dCS Rossini DAC, (though probably counterintuitive for someone building a system around a $4,300 integrated), the DiaLogue has the necessary resolution to allow this premium DAC to shine. Bottom line; the HP is either an amp you can really grow with, or for many people a destination product. After swapping multiple, mega expensive amp/preamp combinations, I never found myself feeling left out with the HP in place. As the amplifier finishes breaking in, the aspects of its initial sound are only further reinforced. There are no compromises here. Both ends of the frequency spectrum are reproduced with uncanny realism, and this amplifier has some of the most realistic lower end control I’ve ever experienced with a tube amplifier, regardless of pedigree. While we don’t take the time to put our test subjects on the test bench, a few other editors that have gone to this length have all remarked on the incredibly accurate square wave response of the HP, which illustrates it’s ability to reproduce transients with incredible accuracy. Techie stuff aside, the HP strikes (for me anyway) a perfect balance of providing the airiness, additional textural feel and tonal saturation that you would expect out of a fantastic tube amplifier, without any hint of coloration, transient smear or sluggishness. That’s a tall order indeed. This is an amplifier that begs to be listened to for hours on end. 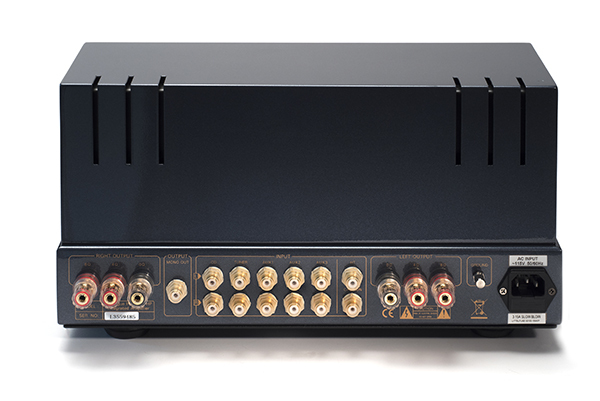 Around back, the HP has five line level RCA inputs, a complete home theater bypass and a variable level mono output for those wanting to integrate a powered sub. This proved helpful when evaluating the latest Dominion sub from JLAudio (which was a perfect match for the Quads, btw) and will make this amplifier a lot handier for someone pairing it up with speakers that could use a little extra help on the lower end. Choosing ultralinear or triode mode couldn’t be easier, you merely push a button on the remote and it’s done. A pair of tiny LEDs on the front panel (green on the left, red on the right) keep you posted. Again, the constant refinement at PrimaLuna is at work here as well. Past models had a slight click during mode change, encouraging having the volume all the way down. This is a thing of the past with the HP; now only the volume changes because of the gain difference. As mentioned earlier, this amplifier is made for tube rolling; input and output. Optimizing the HP for various output tubes is facilitated by the handy switch on the right side of the chassis. One setting for EL-34s, the other for the KT88/KT120 tubes. Right next to it is the headphone/speaker switch, again another thoughtful circuit design; rather than having headphone jack contacts oxidize and potentially collect noise over time, a gentle flip of the switch is all that needs to be done. 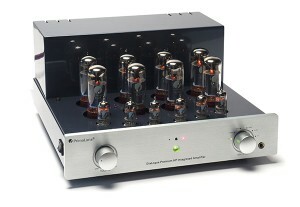 Awesome as the HP is as an integrated amplifier, it’s pretty amazing as a headphone amplifier too. Rather than adding the headphone amplifier as an afterthought to cash in on the current craze, PrimaLuna merely attenuates the output of the amplifier via the switch, utilizing the whole amplifier to power your phones. A quick throwback to the 70s with some Iron Butterfly and Pink Floyd along with the Flaming Lips to keep it in this century, all via the Audeze LCD-2s proves breathtaking. Sampling about ten different phones, it’s clear that the HP succeeds as a world class headphone amp as well. Everything in our headphone arsenal was driven with ease, so true head fi’ers can be confident that the HP will drive the full range of your can collection. This is grain free, tubey goodness at it’s best, providing a number of very long, non fatiguing headphone listening sessions. Revisiting familiar headphone tracks underlines the HPs ability to paint a massive sonic landscape, that like some of the world’s finest headphone amplifiers simply makes the headphones disappear, getting you further into the music. Even with the tough to drive HiFiMan phones, and all of the planars in my collection, the HP has the same bass grip that it did driving my reference loudspeakers. Highs are equally liquid and tonally correct, with a very large sonic space rendered between my ears. With the Audeze phones, I almost felt if I were still listening to the Quads in my listening chair! Like a software release, you have to draw a line in the sand and get the release out the door. But the HP is going to be sticking around here a while, perhaps permanently, so look forward to some more comments as I combine it with a wider range of speakers, cables and do a little more tube rolling. If you need an integrated amp, or even have a pair of separates you’ve been thinking of upgrading, I can’t suggest the HP highly enough. You could pay $4,399 for a pair of interconnects to connect your amp and preamp together and you won’t need it with the HP. This is one of the most incredible bargains in high end audio today.